April 7, 2016 By Amber Leave a Comment This post may contain affiliate links. Read my disclosure policy here. Chicken Enchiladas are a favorite to make and freeze. You can save it for a rainy day when you need to make a last minute meal for someone, or something to have on hand for an evening you don’t feel like cooking. Such a good meal to be able to throw in the oven and have something hot and delicious for everyone. Make a lot or a little! Yummm! 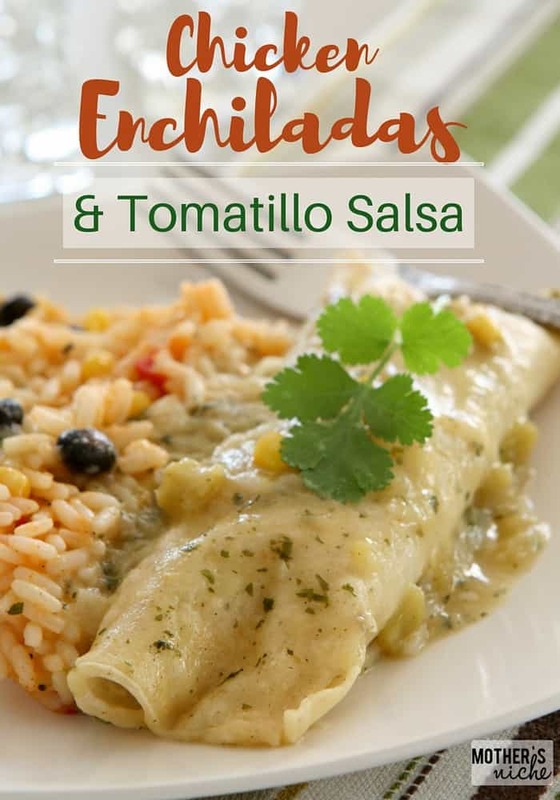 I love enchiladas and this recipe is a favorite though preparation may take some time. Double or triple it — you won’t regret having a lot of leftovers! Heat the olive oil in a large saucepan over medium heat. Add the onion and cook until soft and caramelized, about 7 minutes. Add the garlic and cumin and cook for another minute. Sprinkle in the flour and stir until a thick paste forms. Slowly stir in the chicken broth and simmer until thickened. Remove from the heat and add half of the roasted tomatillo salsa, a handful of fresh cilantro, and fold in the shredded chicken. Season to taste with salt and pepper. To assemble the enchiladas, put a scoop of the filling inside each warmed tortilla and sprinkle with some shredded cheese. Roll up and place in the prepared baking dish. Pour the remaining salsa over top and sprinkle with the remaining cheese. Cover and freeze until ready to use. Let enchiladas thaw in fridge over night. If cooking frozen, cooking time may take longer. Preheat oven to 350 F. Lightly grease a 9×13 baking dish with cooking spray. Bake uncovered in preheated oven for 30 minutes, until bubbling and golden brown on top. Garnish with fresh cilantro and serve with sour cream, shredded lettuce, diced tomato and avocado.